One Ocean Expeditions are small-ship polar cruise specialists offering wilderness and wildlife experiences in the Antarctic, Canadian and Norwegian Arctic and the Canadian Atlantic seaboard. Their professional and engaging expedition staff offer well-informed insights that greatly enrich the passenger experience. 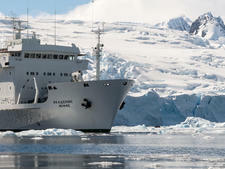 The One Ocean Expeditions ships are all Lloyds 1A rated and are exceptionally stable with ice-strengthened hulls. They have large upper decks offering 360-degree visibility and yet take fewer people than most other polar ships, which means cruisers have excellent access to the wilderness staff onboard as well as onshore and during Zodiac excursions. When the weather is inclement or during travel days, expedition staff offer informative and entertaining enrichment lectures. These expeditions are ideal for active wilderness and wildlife lovers who don't need loads of luxury add-ons. The cabins are spacious and comfortable with attention given to maximizing space. Meals are tasty, plentiful and varied. Alcohol prices are reasonable and there is a good selection of drinks onboard. Most of One Ocean Expeditions passengers are active and adventurous over-50s with a sprinkling of 30 and 40 year olds and a few families. All are passionate about wildlife and cultural experiences. By November 2018 (the company's 10th year of operation), there will be three ships in the One Ocean Expeditions fleet. The brand-new purpose-built polar expedition vessel RCGS Resolute will join Russian research vessels, the Akademik Ioffe and Akademik Sergey Vavilov, to offer safe and exclusive expedition cruises. Built in Rauma, Finland, at the same shipyard as the other two ships, RCGS Resolute will offer modern stabilization and unsurpassed ice classification (Lloyds 1AS) compliant with the new polar code.